When we have friends over for an evening of grilling and relaxing, potato salad is a simple side dish that goes well with just about everything. This is a lighter take on the more traditional mustard or mayonnaise salads, and it is great made ahead and served when needed. Or, if you prefer, you could have your bacon, eggs, and vinaigrette ready to go, and you could grill the vegetables along with your main course. Then you could toss it all together at the last minute for a smoky, warm side dish. Either way would be fantastic! This recipe serves 4, but you could easily double it for a larger crowd. 1. Place the potatoes, green beans, and onions in a large mixing bowl. 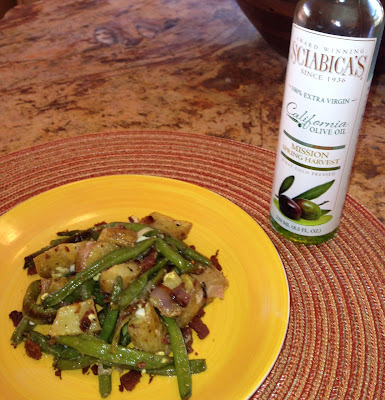 Drizzle lightly with Sciabica's Mission Variety Spring Harvest Extra Virgin Olive Oil, and add salt and pepper to taste. Combine well, as you want all of the vegetables to be coated in oil. 2. Preheat oven to 425°F. Using 2 large baking sheets or casserole dishes, divide the oiled potato, bean, and onion mixture, spreading it out as much as possible. Try not to “crowd” the vegetables, or they will cook rather than roast. 3. Place the 2 pans/dishes side by side (or on upper and lower racks, if they will not fit on the same one) and cook for 10 minutes. At 10 minutes, rotate and switch the positions of the pans/dishes. Cook for 10 minutes more. This rotation is to insure even cooking, as some ovens are not always consistent in their heating. 4. Remove pans/dishes from the oven and let them cool until it is safe to handle them (probably 10 minutes). 5. Place the potato mixture into a large mixing bowl and drizzle with the vinaigrette. Mix gently to coat. Add as much as you would like, but I use about ¾ of the amount made with the recipe below. Just be sure to add and gently mix in small increments, as you do not want the salad to be too oily! 6. Add the crumbled bacon and toss gently to mix. 7. Add the hard-boiled eggs and gently mix. 8. If you feel that the salad is still not quite seasoned enough at this point, feel free to add more salt and/or pepper. This dish can be served warm, room temperature, or chilled. Mix all of the vinaigrette ingredients in a mason jar or other container with a tight fitting lid. Shake to combine. I leave mine at room temperature and shake every 15 minutes for about 2 hours. Store in the refrigerator, but do remember to remove the vinaigrette at least 30 minutes before needed, as the ingredients will separate. Shake well to re-mix before using.